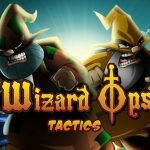 A turn-based, multiplayer, tactical combat game set in the Wizard Ops universe. Players compete for possession of a battleground using a team of wizards and allies with different special abilities. Since this is a sequel to Wizard Ops with the same larger-than-life character design and cute-angry aesthetic, the score is cut from the same cloth. The orchestra score aims to evoke otherworldly mysticism, military grit, and a humorous disgruntlement in equal parts. That said, since this is a turn-based rather than an action game, the score is less frenetic and percussive than its precursor. Atmospheric music abounds. Each battleground gets its own theme reflecting a distinct personality: the murky swamp, the frigid ice fields, and the manic Whimsydome.